In addition to the state variables that are provided by mental ray and are shared by all shaders, every shader has shader parameters. In the .mi scene file, shader references look much like a function call: the shader name is given along with a list of parameters. Every shader call may have a different list of parameters. mental ray does not restrict or predefine the number and types of shader parameters, any kind of information may be passed to the shader. Typical examples for shader parameters are ambient, diffuse, and specular colors for material shaders, attenuation parameters for light shaders, and so on. An empty parameter list in a shader call (as opposed to a shader declaration) has a special meaning; see the note at the end of this chapter. In this manual, the term "parameters" refers to shader parameters in the .mi scene file; the term "arguments" is used for arguments to C functions. Shaders need both state variables and shader parameters. Generally, variables that are computed by mental ray, or whose interpretation is otherwise known to mental ray, and that are useful to different types or instances of shaders are found in state variables. Variables that are specific to a shader, and that may change for each instance of the shader, are found in shader parameters. mental ray does not access or compute shader parameters in any way, it merely passes them from the .mi file to the shader when it is invoked. To interpret these parameters in the .mi file, mental ray needs a declaration of parameter names and types that is equivalent to the C struct that the shader later uses to access the parameters. The declaration in the .mi file must be exactly equivalent to the C struct, or the shader will mis-interpret the parameter data structure constructed by mental ray. (Using the mkmishader utility ensures that both declarations agree, see section mkmishader.) This means that three parts are needed to write a shader: the .mi declaration, the C parameter struct, and the C source of the shader. The .mi declaration is normally stored in a separate file that is included into the .mi scene file using a $include statement. Note that the parameters can be defined in any order that does not have to agree with the order in the declaration, and that parameters can be omitted. Omitted parameters default to 0. This example assumes that the texture tex1 and the three lights have been defined prior to this material definition. Again, be sure to use the names of the textures and lights, not the names of the texture and light shaders. All names in the above two examples were written as strings enclosed in double quotes to disambiguate names from reserved keywords, and to allow special characters in the names that would otherwise be illegal. When choosing names, avoid double colons and periods, which have a special meaning when accessing structured shader return values and interface parameters in phenomenon subshaders. A light group is an instance group that contains instances of lights. For the purpose of shading, the group is treated as if it were a single light. It is strongly recommended to use the same parameter names in the C declaration as in the .mi declaration. Also, structures in either declaration should be reflected in the other, even if not enclosed in arrays, to ensure that mental ray inserts the same padding as the C compiler. 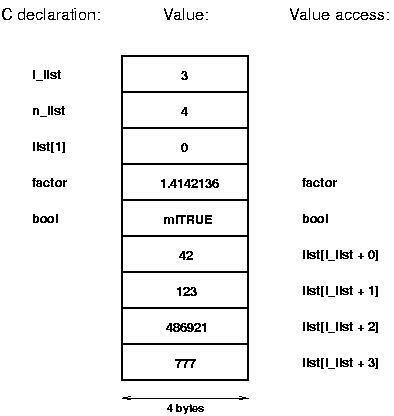 Arrays are more complicated than the types in this table because the size of the array is not known at declaration time. The C declaration of an array consists of a start index prefixed with i_, the size of the array prefixed with n_, and the array itself, declared as an array with one element. mental ray will allocate the structure as large as required by the actual array size at call time. To access array element i in the range , the C expression must be used. This expression allows mental ray to store the shader parameters in virtual shared memory regardless of the base address of the shader parameter structure, which is different on every machine on the network. On multithreaded machines, it is possible that any given shader runs in multiple threads simultaneously. When this happens, they share all static variables defined in the sources, all shader parameters, and the user pointer. The only things that are separate in separate threads are "auto" variables on the stack, and the state variables. Also, mental ray makes sure that an init shader runs once, in a single thread, before the actual shader runs in one or more threads. This makes init shaders the natural place to set up the shader user pointer, perhaps to store preprocessed shader parameters. See section multithreading for more information on multithreaded shader design.